So in the story I'm writing, mankind has advanced farther in the next few decades than we have over the past couple thousand years. Colonization has allowed us to settle the planets, and the FTL drive has opened up the ability to reach the stars. But for in-system travel, it wasn't until recently that we began to embrace a fuel source that was both powerful and efficient enough to get a ship across the solar system in a matter of days: metallic hydrogen. Although this resource was nearly impossible to create in the early 21st century, engineers and scientists realized that it could remain meta stable outside a high pressure environment. And with probes confirming large deposits of it on Jupiter and Saturn, a rush formed to mine this nearly limitless resource from the planets' lower atmospheres (much like the oil boom during the industrial revolution). So, if we managed to synthesize meta-materials capable of withstanding the extreme pressure and weather of Jupiter and Saturn, what would be the best method to set up a series of mines that are capable of tapping into the layers of metallic hydrogen far below these planets' clouds? You can have a solid and liquid form of metallic hydrogen. It is, however, all still just hydrogen at different pressures. This paper has a pretty good introduction to dealing with/forming metallic hydrogen in the lab (could be interesting for further points in your story. The graph below (from the paper above) shows your transitions. The basis of your question (I suppose) is how to get the hydrogen out and keep it in the same phase in the diagram. 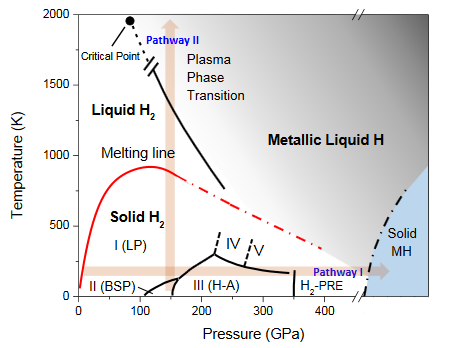 So we need about 500Gpa of pressure to have our hydrogen solid metallic with low temperatures. My thinking here is that the solid takes up less room and low temperatures and high pressures, perhaps, are easier to maintain in a space ship where you might lose power. Firstly a point about the hydrogen (which my method will hinge around), whilst you want it in its metallic form in the end it doesn't have to always be this way. I've only been able to find evidence of liquid metallic hydrogen. Lower pressure pipe: Your pipe is at a lower pressure on the inside and at the bottom lets the hydrogen in, where the liquid hydrogen will become gaseous and travel up your pipe more easily. Lower temperature in the pipe: Your pipe could be cooled at the bottom, making the liquid hydrogen drop out into its gaseous state and, again, be more easily pumped out. For the same reasons I stated above I think the pressure is a better method. The crux of it is that what you're going to do is make your hydrogen non-metallic to get it out, then repressurise it again once it reaches your platform. Another point is about the pipe, platform and them being subjected to incredibly high winds. Your pipe would need to be very strong but flexible (most likely in sections that have flexible connectors). These could connect up to platforms which shouldn't, I don't think, be orbital (I imagine the pipe being connected to an orbital platform would drag too much on the pipe and break it more often) better to have some sort of blimp that you can collect the hydrogen from periodically. Edit: Just to point out that it is possible (but not experimentally proven) that the hydrogen could be meta-stable in it's metallic state. See Mike's comment or the end (~page 8 of the paper I added). This would mean you don't have to necessarily keep at as high a pressure once it has been formed. This doesn't stop the method of extraction working since liquids with the option of different pressures will still travel towards the lower. It is, however, an interesting point that could be used in your story. At the moment we don't know so you choose how it is in your world. You can attempt to use the chimney principle, turning the pressure differential at your advantage. Place a convergent pipe near the core, provide an heat source to warm up the hydrogen and let it float up into the chimney. Wait at the other end of the chimney and harvest what gets out of there. Your actual mine would be entirely robotic. There's absolutely no point even thinking about sending manned vehicles that deep. So it would consist of robots under AI control mining the metallic hydrogen and dumping it into containers. You'd need to make sure that their hulls were very well insulated, too, to survive the powerful electrical currents that must be running around Jupiter's interior to generate that magnetic field. The containers are the fun part; how do we get them back up? The best option is likely to be by using effectively hot-air balloons. Create a large envelope and heat the liquid metallic hydrogen inside. The balloon can then ascend through the oceans and cloud layers above. As it ascends and the pressure changes, the balloon would have to be constantly heated and modified to remain less dense than the ocean/atmosphere around it. You probably couldn't get all the way to the upper cloud layers with a balloon - they're already made of hydrogen, after all, so the balloon would lose a lot of its lifting power - but it should get the load high enough to be hooked by a recovery vessel. Of course, the other option is even more fun - pick a gas giant, and get rid of the atmosphere. Blow away the hydrogen and helium envelope to expose the core, and mine it directly. But if you have the tech to do that, you can probably make your own damn metallic hydrogen. Not the answer you're looking for? Browse other questions tagged gas-giants megastructures mining or ask your own question. How to harvest resources from a gas giant? How can I get a habitable moon of a gas giant to cool once it is in the planet's shadow? How Large Would A Gas Giant Appear To Be To The Inhabitants Of An Earth-like Moon Orbiting it?